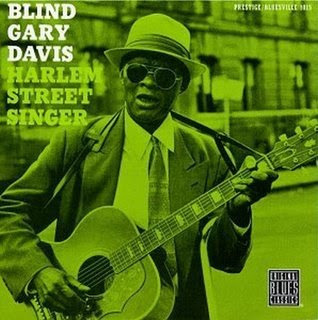 Recorded during a three hour session at the Jersey Jazz Studio of the legendary engineer Rudy Van Gelder on August 24, 1960, Gary Davis laid down 12 of his most impassioned spirituals for "Harlem Street Singer". You get 44 minutes of soul survival stuff here, and any blues buff ought to own it. The more casual fan may have to listen a few times to really like Gary's vocals, but his guitar work is fun from the first chord. The recording quality is excellent. Starting off the session with a version of Blind Willie Johnson's "If I Had My Way I'd Tear That Building Down," here renamed "Samson and Delilah," Davis is in fine form. His vocals are as expressive as Ray Charles' while similar in richness to Richie Havens' work. "Harlem Street Singer" features his inspired country blues fingerpicking as well. Many moods color the selections, from the gentle "I Belong to the Band" to the mournful "Death Don't Have No Mercy," only to be followed by the joyous shouting of "Goin' to Sit Down on the Banks of the River." Overall, the collection should be considered essential listening for fans of country blues or gospel.